The Manayunk Development Corporation / Manayunk.com has launched the public survey portion of our Strategic Planning Process. This is our chance to get important feedback from the wider community; folks who live here, play here or just occasionally visit for events. We want to know what YOU and YOUR GROUP think about our district and your feedback is a vital component of our planning process. To that end, please take the survey below. 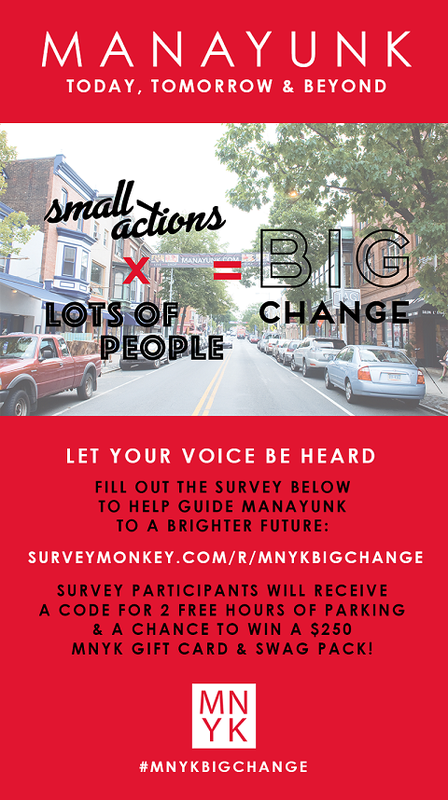 As a thank you each survey respondent will be given a code at the end of the survey for 2 FREE HOURS OF PARKING in any of our Manayunk owned parking lots valid until 3/31/18 and will be entered to WIN A MANAYUNK GIFT BASKET. The Delaware Valley Regional Planning Commission (DVRPC) has awarded $7.9 million to ten local projects in Southeastern Pennsylvania through the Transportation Alternatives Set-Aside Program (TA). Additionally, $4 million will be dedicated to future projects over the next three years. The federal program funds community-based “non-traditional” projects designed to strengthen the cultural, aesthetic, and environmental aspects of the nation’s intermodal transportation system. Selected projects include trail, sidewalk, transit station, and on-road bicycle improvements. In addition to this funding round, there are 29 additional projects worth $22.4 million, which will be recommended for funding through a Statewide TA selection process in spring 2018. The projects and funding are listed below, with Circuit projects in green. 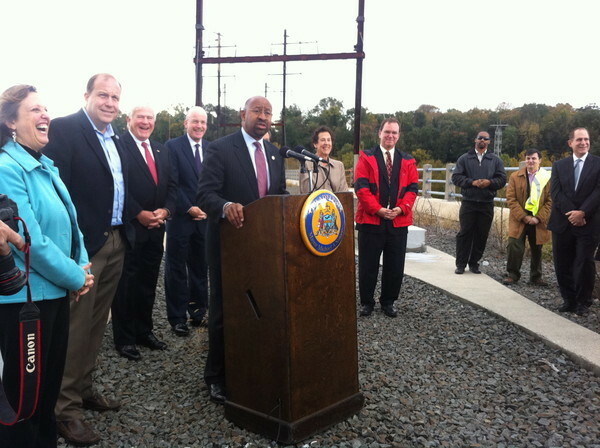 Parkside Cynwyd Trail Extension ($534,000) – Construction of a rail with trail project. The project proposes to extend the Parkside Cynwyd Trail, in Lower Merion Township, from the Cynwyd SEPTA station to the Montgomery-Philadelphia County line. There was business on the agenda as board member, Bruce Reed, Nominating Committee Chair, held a vote and announced new board members and welcomed incoming President, Kitty Rapalyea. Kitty acknowledged and thanked outgoing President, Brandon Shuler, for his incredible support and commitment to the Friends group. Bala Cynwyd, PA – July 2017 – With summer in full swing, West Laurel Hill’s sustainability efforts are growing. For the second time around the goats are back, but for a longer stay! Brought in from Rhineback, NY, they’re a new part of West Laurel Hill’s sustainability efforts and will help to control invasive species, weeds, thorns and poison ivy by climbing up the hillside behind the cemetery’s green burial site, Nature’s Sanctuary. The three main reasons WLH has decided to go this route is to cut down on greenhouse gas emissions, cut labor costs and lessen the use of herbicides. Goats have been used to control undesirable vegetation throughout history. They’ve eaten grass, and cleared brush on slopes, woodlots and hedge rows long before brush cutters or herbicides were invented. Cost savings compared to conventional gas powered methods have been in the 50% to 75% range. Additionally, goats have become an attraction for visitors. The duration of their stay is three months to make sure everything is eaten two to three times over and ensure the weeds are gone. This is officially the cemetery’s new model to handle invasive species throughout the grounds and the process will be repeated in the same area next year. There are six goats which you can see in action from now through September along the Cynwyd Heritage Trail, right behind West Laurel Hill’s green burial site. For more information on our sustainability efforts visit www.westlaurelhill.com/about/sustainability. On December 5, 2016, The Friends of the Cynwyd Heritage Trail held their 2016 Annual Meeting and Reception in the Conservatory at West Laurel Hill Cemetery. Community members, volunteers, board members, local commissioners and even a few trail-loving kids celebrated the accomplishments of 2016. In 2016, The Friends were fortunate to have many hard working volunteers and several were recognized with awards. Liz Paul accepted an award on behalf of the BuildOn Lower Merion High School Chapter. In 2016, the local BuildOn groups showed up consistently to work days helping plant new gardens, fight weeds, and keep the trail clean. Spencer Segal was also recognized for the work he did with The Friends for his senior project. He assisted in planning and planting the new garden at the entrance to West Laurel Hill at Barmouth Trailhead. His parents were present to accept his award. The Outstanding Citizen Award went to Ted Goldsborough, who has been quietly and continuously removing graffiti from the trail for several years. His hard work is appreciated by all! Rebecca Rutstein was recognized as the first ‘Outstanding Achievement as Board Member Award’ recipient, for her behind the scenes graphic design work over the last few years. President, Brandon Shuler and Vice President Kitty Rapalyea shared an overview of 2016 accomplishments and plans for 2017. The Friends are looking forward to another productive year! The celebration also included guest speaker James Kahn, a Philadelphia lawyer, who among his many qualifications is a lifelong cyclist, who helped found the Schuylkill River Development Council which planned and helped build the Schuylkill Banks trail in Center City Philadelphia. He has also initiated and led efforts to provide bicycle street signage which leads riders and runners to the Cynwyd Heritage Trail, Manayunk Bridge, and through West Laurel Hill Cemetery to the new Pencoyd Bridge. His knowledge and perspective were welcome additions to the festivities. Bourbon Blue prepared a delicious array of hot and cold appetizers, along with beverages. As always, a fantastic catering experience! The Annual Meeting and 2016, as a whole, were definitely a success. A big thank you to all of the volunteers and community members that helped make that possible! 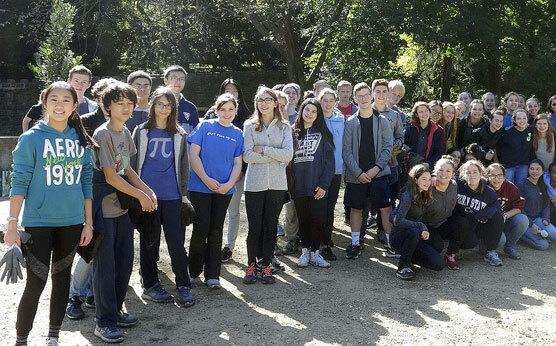 On November 19th, an unusually sunny and warm Saturday, approximately 50 BuildOn volunteers from Harriton and Lower Merion High Schools and Bala Cynwyd Middle School along with a few community members gathered at Barmouth Trailhead. The group made quick work of clearing a large inclined area along the trail. They cut and pulled out the invasive knotweed, vines and other weeds, we plan to plant native plants to replace the knotweed to create a better environment for our native wildlife. A second wave went back through with shovels and dug out the roots to try to prevent them from returning. Some of our younger volunteers walked the trail, cleaning up trash as they went. After the weeds were bagged and the trail cleaned up, the impressive amount of work that had been completed was obvious in the huge pile of bags ready to be picked up and removed. Thanks to all of our volunteers for a job well done! We couldn’t do it without you. Saturday, October 15th was another successful work day on the trail. Around 50 volunteers from Lower Merion and Harriton High School BuildOn groups, community members and FOCHT board members showed up ready to work. The large group made quick work of planting over 200 bulbs at Barmouth, the Belmont trailhead and the overlook at the Spaventa Curve. Next, more plants were added to the new Barmouth garden, and the beds in that area were weeded. After accomplishing those tasks, the BuildOn groups dug out knotweed roots north of Barmouth. At the same time, a group of Community Service students weeded and cleaned the entrances to the Manayunk bridge. It was a beautiful day and in addition to the trail work day, it was the 2nd day of the Susan G. Komen 3-Day Breast Cancer walk. Throughout the morning, the volunteer groups cheered on the walkers and received many compliments from them in return. Thanks to all who volunteered for their hard work! See you on the trail. Save the Date…The wait is over, it’s almost here! The ribbon cutting for the Manayunk Bridge has been scheduled for Friday, October 30th at 11:00 a.m. More details will follow as we get closer to the date. Upon completion of The Manayunk Bridge renovations, ribbon cutting ceremonies, The Friends of the Cynwyd Heritage Trail will Celebrate The Manayunk Bridge opening with Carnival themed entertainment & food for the entire family. Date and time to be announced in the coming weeks. DVRPC Data Shows Increased Demand for Circuit Trails! The data collected by the permanent bicycle and pedestrian counters shows significant use of these regional transportation assets. DVRPC maintains one of the nation’s most widespread bicycle and pedestrian counting programs. The counters combine a passive infrared sensor, which detects body heat, with an inductive loop, which detects the metallic signature of bicycle wheels, to provide a count of pedestrian and cyclists, including their travel direction. This technology paves the way for the introduction in Philadelphia of real-time “bicycle barometers” that simultaneously collect data and encourage bicycle use due to their prominent visibility and digital displays. Upon completion of The Manayunk Bridge renovations, The Friends of the Cynwyd Heritage Trail will Celebrate The Manayunk Bridge opening with Carnival themed entertainment & food for the entire family. 3rd Place in Recent Whole Foods Contest!! The Friends of the Cynwyd Heritage Trail recently placed 3rd in a Community Support Day event sponsored by Whole Foods. The winner, the Natural Lands Trust, was the recipient of roughly $5,000. The Friends received a small donation for 3rd, but is poised for victory when the next opportunity to compete presents itself. Big thanks to board member Shirlee Howe for making the connection with Whole Foods! You probably have noticed the new mile markers on the Trail. Our wonderful neighbor, West Laurel Hill Cemetery, has graciously contributed the production and installation of these beautiful mile markers alongside the Trail. Everyone can now know just how far they are walking, jogging, or cycling. Why is there engraving on just one side? The markers are set every half mile from both ends of the Trail. So the distances are indicated in the direction of the starting point. Update: The Friends have recently completed the Basin project for 2013. This was no small undertaking. The Friends coordinated workdays on September 14th and 21st and October 6th, 19th and 26th. During those workdays, we primarily focused on the Bala Park wetlands but we also were able to devote time to the Cynwyd Club/Cynwyd Station as well as Barmouth. We had hundreds of volunteers participate but we couldn’t have done it without PHS, Rockwell Associates, Lower Merion High School’s BuildOn, Lower Merion High School’s Swinging for Change and Saint Joseph’s University. In addition to the countless volunteers, we also need to recognize Lower Merion’s Parks and Recreation Department who supplied 15 yards of compost to amend the beds and has removed the big piles of debris that we generated during the renovation. We accomplished a tremendous amount, had fun and we ate a ton of Pizza! The basin project was no small undertaking. The landscape was poorly designed, with no plan to maintain it. We were able to selectively remove inappropriate plantings and rearrange the shrubs and small trees into logical masses which will be much easier to maintain going forward. 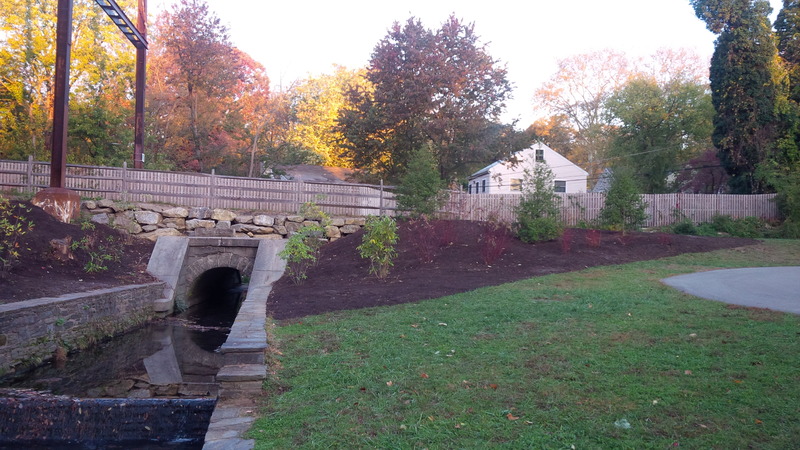 We also improved the design and accessibility of the space by creating planting beds on the other side of the creek and to fill these beds with plants transplanted from the wetlands. The new design respects the curving grades of the wetlands and the new beds complement the beautiful lines of the creek and stone bridges. The green area between the beds now work as gathering space and path through the landscape. The basin still could use some additional plantings but the Friends are so pleased with all that we have accomplished this year. The Friends received a Green Machine Award from the Pennsylvania Horticultural Society. The Green Machine team consists of technical experts in gardening who will work with the Friends to plan and care for existing planting beds and planters. Through the Community Integrated Design Process, PHS provides horticultural assistance and training to better sustain and manage the plantings in area parks. Working collaboratively with neighborhood volunteers and Lower Merion Township, the Green Machine program’s goal is to revitalize our gardens, educate participants about sustainable greening, and help make parks more beautiful. On November 19, 2013, the Friends will hold their first ever Annual Meeting. The meeting is our opportunity to give our membership an update on the future of the Trail and our role in that future. We will explain the “Phase 2” design plans, the status of the Manayunk Bridge renovations, and other plans for continued Trail expansion and beautification. It also allows us to meet, face-to-face, with our members and hopefully encourage your continued support and involvement. The meeting is open to the public, and will be held at 7:30 at the West Laurel Hill Cemetery Conservatory. Enter the cemetery across from Bala Playground on Belmont Avenue. More info to follow. As a responsible pet owner you should never allow your dog to run free, or even be off leash while you walk together. If you have not considered the many reasons why your dog should be on a leash than consider these reasons..
1) Dogs who are off the leash may cause injury to a person.This does not necessarily mean that your dog has bitten someone. Injuries to people can come in other forms. What if your dog scares an elderly person and they fall down? What if your dog knocks a small child over? 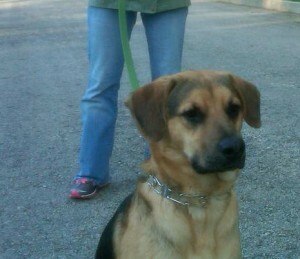 You as the owner are responsible for your dog’s behaviour. 2) Your dog could eat something unhealthy. Dogs love to put things in their mouths. Dogs may drink contaminated water or walk through an area that was sprayed with pesticides. They may chew on a dead animal while roaming and pick up worms, or parasites. The list of possibilities is staggering. Any one of these things might cost you an expensive trip to the vet, and in the worst case scenario may result in the death of your beloved pet. 3) You do have neighbours. People who allow their dogs to roam free are giving responsible pet owners a bad name. Due to a small number of negligent owners, more and more bans and restrictions regarding dogs are being put into place. 4) You may own a very friendly dog, but what about all the other dogs? Your dog might be attacked by another dog if that animal considers your dog to be invading his territory. Or another dog may see your pet as a potential danger to his owner. Your dog could be seriously hurt or killed. If your pet is the one not on a leash you may find yourself responsible not only for any veterinary bills regarding your dog but any bills incurred by the other dog as well. 5) Dogs do not respect wildlife. A dog that is allowed to roam free, may hurt or kill young wild animals. He may destroy the nests of ground birds. You also face the risk of having your best friend encounter an unfriendly variety of wildlife. Anyone who has had the pleasure of trying to wash off the delightful smell of skunk will tell you it is not an easy task. Removing porcupine pine quills is another chore that you would do well to avoid. Depending upon where you live, there may be even more dangerous predators that your dog may encounter. 7) A dog who is not on a leash will go to the bathroom almost anywhere including in our flower beds. If you do not have control over your pet you can’t be sure where he is doing his business. This can be extremely annoying to your neighbours and other pet owners. 8) It is the law! Be a responsible pet owner, keep your dog on a leash. Take Action: Make it safe and easy to bike in Pennsylvania. Pennsylvania is a great place to bike and walk. Many of cities are bike- and pedestrian-friendly — and the vast networks of trails are a great way to enjoy the outdoors and go about daily trips. In fact, 12 percent of all trips made by Pennsylvanians are by bike or by foot. The state Senate has already approved a comprehensive transportation budget that dedicates funds for biking and walking projects. Now, the Pennsylvania House of Representatives must act before the end of the month. You can help ensure that the Keystone State continues to invest in biking, walking and trails by urging your state representative to follow the senate’s lead. Take Action Now: Tell your Pennsylvania State Representative to support funding bicycling and walking in the state budget by using the form below. A personalized message about why you support biking, walking and trails will have more impact. Do you sh​are our vision of a 750-mile circuit of bicycle and pedestrian trails connecting the Greater Philadelphia region? The Circuit Commitment Campaign’s goal is to secure $10 million for trail planning, design and construction. We are asking County Commissioners & Freeholders from the nine regional counties who sit on the Board of the Delaware Valley Regional Planning Commission to approve allocating this $10 million to the Region Trail Fund to keep building out The Circuit. Click the link below to see how You can help to convince County Commissioners to make a $10 million commitment to The Circuit. Is the grass too high? Did you notice graffiti? Does the trash need to be picked up? Is there a tree down? If you need to report anything on the trail, please contact Lower Merion Parks and Recreation Department at 610-645-6220. The Township records, tracks and follows up on all complaints. Another common complaint falls into a different category – crime. If you see a crime being committed, call 911 (or the LM Police at 610.649.1000) and report your location by the sign number on the nearest power pole. Even if it’s just a dog off leash, please make a public record of the event. This is important for how resources are assigned to the Trail. Chris Leswing: CHTs Ordinary Hero! Chris had the vision and steadfast organizing skills to create the Cynwyd Herritage Trail, a rails to trails project that enhances my neighborhood and provides a beautiful place for walkers, pets, and rollers young and old. He guided the process from beginning to end inspiring hundreds of volunteers and raising the thousands of dollars required to accomplish a wonderful transformation of this space. For his devotion and determination, Chris is my hero. The Friends are pleased to announce that we will be adding to the trail amenities: High Security Public Bike Pump. This bike pump is heavy duty stainless steel construction ensures years of service. The hose is cut resistant and durable. If you would like to be a sponsor of one of these bike pumps, contact the Friends at info@cynwydtrail.org. Suggested Donation: $500. All contributions above cost are tax deductible. Recognition: In recognition of your gift, a plaque with your name will be inscribed. 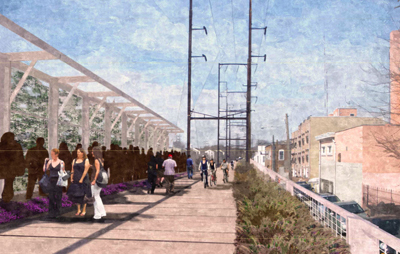 Work on the Manayunk Bridge is expected to begin in 2014 with a target date for opening later in 2014. 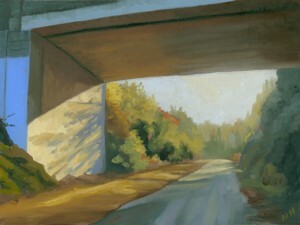 The bridge will serve as a connector between the Cynwyd Heritage Trail (Lower Merion) opposite Manayunk ( Philadelphia) and recreation trails that currently skirt the eastern banks of the Schuylkill. With approximately $3.5 million of funding in hand – $2.4 million of which is PennDOT support secured through the city, with the balance coming from or through neighboring Lower Merion or Montgomery County – construction bids will begin in June. Honor a friend or a family member, while providing lasting beautification to our trail. 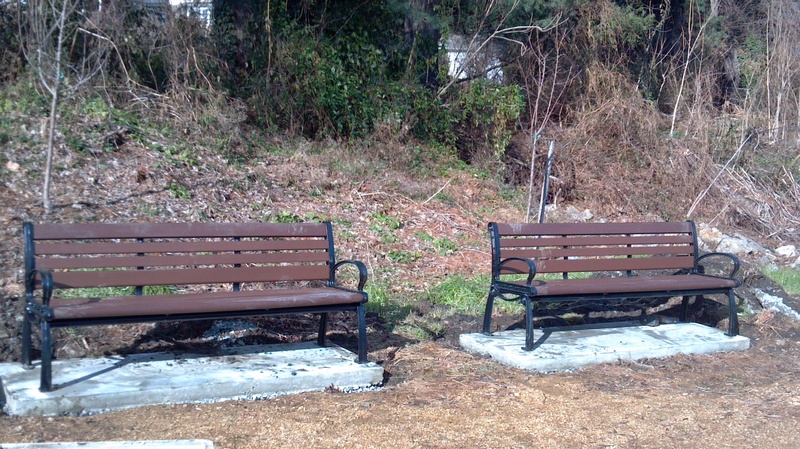 The FOCHT’s “Donate-A-Bench” program aims to enhance and beautify the Cynwyd Heritage Trail. Any individual, family, business or community group can purchase a bench with a personal message on an engraved plaque to be placed on the trail. Pricing: Donations start at $1500.00 for a new bench. All contributions above cost are tax deductible. Recognition: In recognition of your gift, a bronze plaque with your personalized inscription will be mounted on the top center slate of the bench. The inscription can be made in honor of a loved one, for an anniversary remembrance, or as a gift from a civic or business organization. 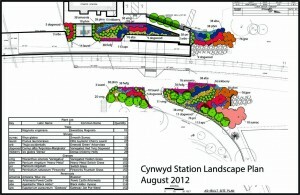 If you are interested in sponsoring a bench, please contact the friends at info@cynwydtrail.org. Trail users have no doubt noticed the gray trailer at the Barmouth Station. It is indispensable for storing tools and supplies used on workdays and events sponsored by the Friends. However, it’s not exactly a postcard scene, particularly in front of the marvelous stone and gate work that our friends at West Laurel Hill Cemetery have accomplished improving the cemetery’s entrance there. So, we’re moving the trailer to the other side of the Trail where it will be less noticeable in the woods. Landscaping for this purpose has begun, and one of the first tasks is to place a bed of crushed stone for leveling and corrosion protection. We are grateful to AP Construction of Blackwood, NJ for donating one hundred tons (that’s 200,000 pounds) of stone for the trailer bed! We are also thankful to Board member Barrett Dunigan, who has donated his time and construction expertise to managing the project. We hope to have the trailer moved to its new home in the next month or so. The Friends are pleased to announce that Green Mountain Coffee accepted our application and request and provided us with enough coffee for the remainder of our 2013 workdays. Green Mountain Coffee has a program that offers coffee to brew, giveaway packages for events, and items for raffles or auctions. FOCHT met the requirements and received a box of bagged coffee. Thank you so much. The Schuylkill River is a finalist in the 2013 PA River of the Year Contest. The award is an honor bestowed upon a Commonwealth river to elevate public awareness about that resource and recognize important conservation needs and achievements. Ian Guinnane to Build Composting Stations on the Cynwyd Heritage Trail. Lower Merion Township receives grant for $500,000 for the development of the Manayunk Bridge multi-use trail connector, to include the design and construction of approximately 0.5 miles of trail on the Manayunk Bridge to connect the Cynwyd Heritage Trail to the Schuylkill River Trail; ADA access, landscaping, project sign, and other related site improvements. 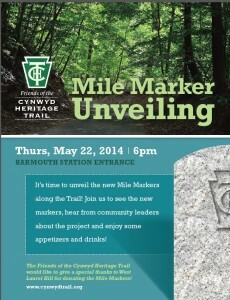 Cynwyd Heritage Trail Joins the Circuit Coalition. The Cynwyd Heritage Trail has been selected to receive a 2012 Montgomery Award, Lower Merion spokesman Tom Walsh announced today. The award acknowledges outstanding land developments and revitalization achievements throughout Montgomery County. The awards honor developers, consultants, organizations, and municipalities for their enhancement of Montgomery County. The Montgomery County Board of Commissioners and the Montgomery County Planning Commission Board will hold an awards presentation for the winners at 10:30 a.m. on Wed., Nov. 14, in the Montgomery Conference Room (Suite 202) of One Montgomery Plaza in Norristown. At the end of September, Friends of the Cynwyd Heritage Trail hosted volunteer workdays around Cynwyd Station. It was a great event. We had over 100 volunteers. We thank everyone for coming out and donating their time to help us with all the planting. 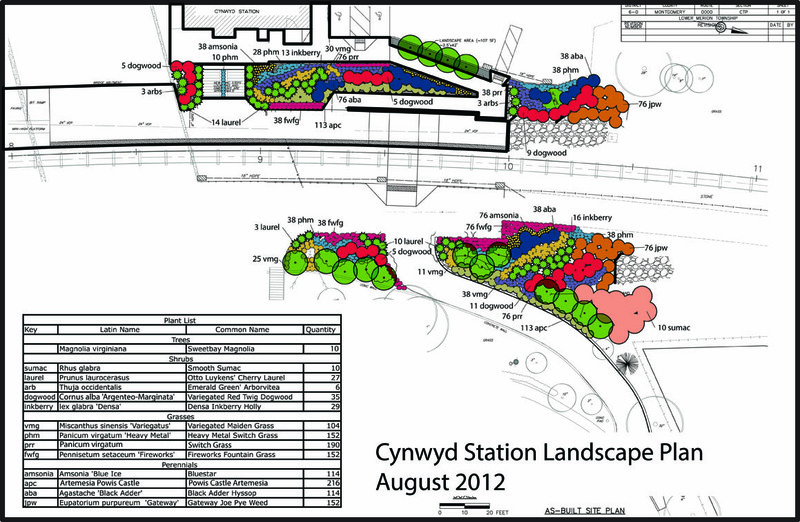 By next year, all the hard work will pay off and the Station area and Trailhead will look wonderful! Hymie’s & Louis Barson, for sponsoring the breakfast for all the volunteers for the planting. Rockwell Associates for volunteering and providing landscaping, tools and service. We have spent a lot of time weekend planting perennials, shrubs, and trees that help soak up storm water. The Trail also has a bioswale running along the side and a new wetlands by Bala Cynwyd Park. Please do your part to mitigate runoff and increase the quality of our waterways and get a rain barrel or composter (better soil holds more water). Public Works began installing drainage pipe and inlets to handle the amount of stormwater that flows from Westminster Cemetery. The work will require excavating part of the Trail, which may need to be closed intermittently while work is being done. The area will be covered by plates, and signage will warn trail users of the uneven surface. Once the work is completed, Public Works will restore the paved part of the trail and Parks will restore the soft surface trail. 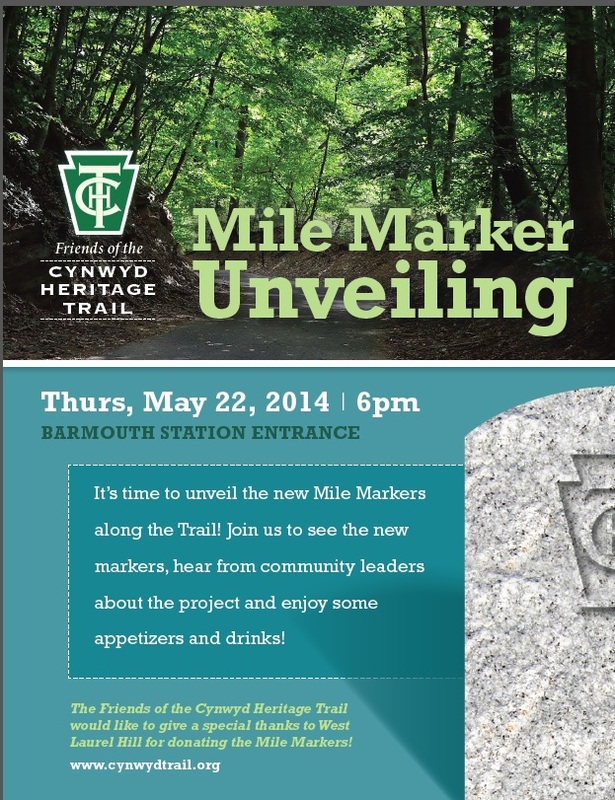 The Friends of the Cynwyd Heritage Trail are pleased to announce that we are going to be adding mile markers to the trail. West Laurel Hill has generously agreed to donate the mile markers. A Mile Marker Committee has been established and we are currently working on the design, installation, maintenance, construction, layout and communications. The Friends have begun to mark the areas where the markers will be placed. Look for the fluorescent pink stripes on the trail. The trail markers not only serve to mark the distance, but also provide a level of safety. The Friends are so grateful for this partnership and couldn’t be happier with the progress so far. Did you see the white spray paint on the trail? Notice the stakes? These are indicators that work is in progress. There are two projects occurring. First, the Township will be correcting the washout areas. The other marks are test areas being treated with selective herbicide in advance of fall reseeding. * New ADA-compliant pedestrian ramp connecting the parking lot to the platform level on the Station side of the tracks. * New pedestrian/rail crossing allowing trail users to cross the railroad tracks safely to access the recreation trail. * New fencing separating trail users from the active rail tracks. 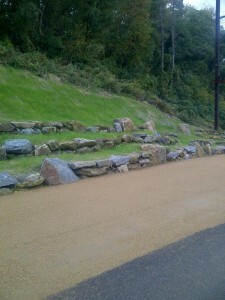 * New paved plaza on the trail side of the tracks to serve as a trailhead gathering area. 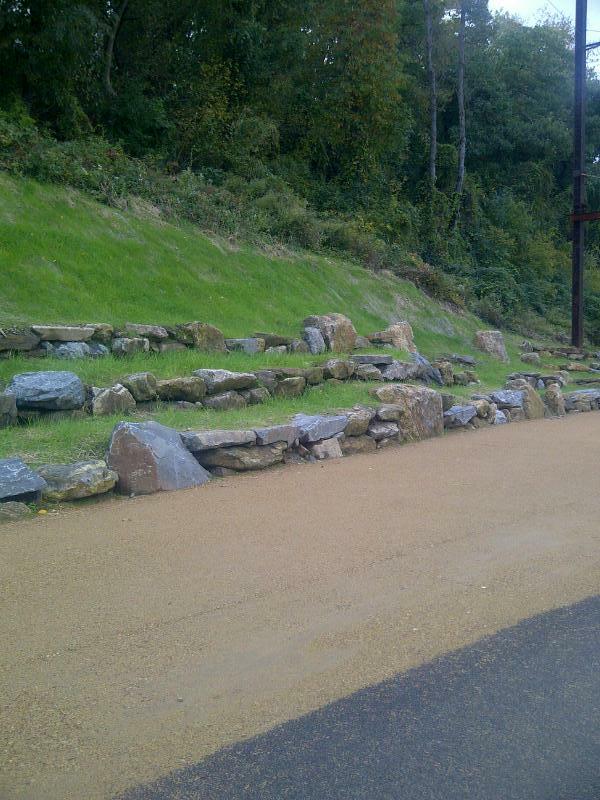 * Improved and widened driveway for emergency vehicle access on the trail. * Landscaping and public amenities. The Lower Merion Township Board of Commissioners recommended denying approval of O’Neill Properties Group’s plans for the now-vacant lot that formerly housed the Connelly Container/Georgia Pacific factory, adjacent to the township’s property that the Cynwyd Trail occupies. “For four years, the township has been bragging about how it is connecting to a trail network in Philadelphia via the Pencoyd Bridge” on my property,” the developer said. “If my plan isn’t approved, they don’t get the trail, nor do they get the bridge.” Read more about the decision-making process here. Interested in learning about the perennials that we planted for Earth Day 2012? Well, below is a list of all the flowers, growing tips, maintenance and so much more. The Friends can’t wait to experience all the flowers this summer when they are in full bloom. There will be wonderful blooms in the summer and fall. Lower Merion’s Township’s Health Advisory Council urges all residents to be alert for ticks due to the mild winter and early onset of warm weather. Please see the following document from the Lower Merion Health Advisory Council. Friends of the Cynwyd Heritage Trail, in cooperation with West Laurel Hill Cemetery and the Neighborhood Club of Bala Cynwyd, are proud to sponsor the first annual Cynwyd 5K and 1-mile walk on Sunday, May 6, 2012 starting at 12:00 pm. Race starts at 1 pm, walk starts at 1:15. Click here for more information on this web site, or click here to register for the event (link to Bryn Mawr Running Company web site. Please join the Friends at the next Parks & Recreation Committee meeting. We need community support for the funding of the Manayunk Bridge Project. It will be on Wednesday, March 21 at 7:55 pm at the Township Administration Building, 75 East Lancaster Ave, 2nd Floor, Ardmore, Pa 19003. Learn more about the issues to be discussed thanks to Patch, the community news web site, by clicking here. The Friends are proud to support Boy Scout Troop Bala One and Scout Eric Ramsey’s Eagle Scout project to install bat houses along the trail. The Friends have agreed to fund the purchase of the bat houses, and Eric will facilitate the placement and installation. The project is scheduled to be implemented on Saturday, April 14, 2012. 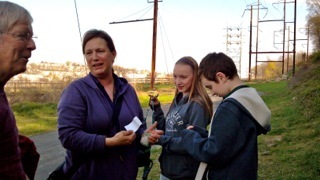 Click here to learn more about bat houses and why they are important to the Cynwyd Trail. This weekend someone created three geocaching spots on the trail so if you wondered what all those people were doing with GPS looking around in the weeds, now you know. If you’re not already familiar with geocaching, it is a fun hobby based on navigation and compass skills. Learn more about geocaching, including how to get started, at geocaching.com, the official global GPS cache hunting site. These people were hoping to be the first ones to the new location but alas NO. At the March 21, 2012 LM Commissioners meeting, an important vote carried UNANIMOUSLY in favor of matching $250,000 in a grant opportunity for developing and extending the Trail across the Manayunk Bridge. The match greatly improves the probability of receiving other grants totaling $1.4M for the project. Total project cost is estimated to be $2.7M, with the difference already secured from the City of Philadelphia. Many thanks to all of you who signed the petition and attended the meeting in a great show of support! 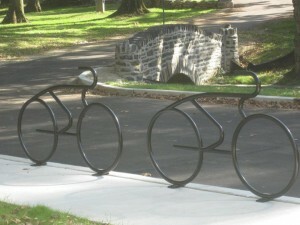 The Bicycle Coalition of Greater Philadelphia, in cooperation with the Friends of the Cynwyd Heritage Trail, is petitioning the Lower Merion Township commissioners and the Montgomery County commissioners to approve funding for the extension of the trail across the Manayunk Bridge to join the Ivy Ridge Trail. In total, the project is estimated to cost $2.8 million, and the City of Philadelphia has already pledged $1.3 million. Read more about the petition here, or click here to learn more about petitioning the Lower Merion commissioners. The Main Line Times and Philly.com Neighbors blog also highlight the Township’s efforts to fund the project. Dreams of a trail across the Schuylkill are one step closer to reality after Lower Merion commissioners have given township staff the green light to pursue a $500,000 state grant toward reopening the Manayunk Bridge. However, they want more information on how to provide the required matching amount. Learn more about their decision and what lies ahead here. Additional information is available via Patch by clicking here. Even the Philadelphia Inquirer’s Neighbors blog is getting excited! Each link opens in a new tab. Will the township fund the project? The thought is that the Manayunk Bridge will connect Cynwyd Heritage Trail to Philadelphia’s Ivy Ridge Trails, but a funding gap for the $2.5-million construction portion of the project still remains. The $1.3-million Pennsylvania Community Transportation Initiative grant given for the reconstruction required for the bridge could foot almost half of the bill. Though the City of Philadelphia will manage the construction process, Lower Merion is still heavily invested in the project, as it plans to lease all, if not portions, of the Manayunk Bridge from SEPTA. (SEPTA bought the bridge in 1976.) The Board of Commissioners gave the township the go-ahead to prepare a grant application to eventually submit to the Pennsylvania Department of Conservation and Natural Resources. If awarded, the $500,000-grant would require a $500,000 match. The board hasn’t decided how it would match the amount, but if it would add $1 million to the construction portion of the project, leaving the city, township and Manayunk Development Corporation with a much smaller gap of $200,000. Mayor Michael Nutter and several others were on hand for the ribbon cutting and re-opening of the Manayunk Towpath, after extensive cleaning, repairs, and other improvements. With the planned connection to the Cynwyd Trail this makes the Manayunk Towpath even more of a destination to look forward to! Read the whole article on Patch here. Cynwyd Trail Winter Trek a Success! Dozens braved the winter weather to learn more about what the trail offers, even in the off-season. After gathering for hot chocolate, coffee and snacks, Lindsay Smith of the Lower Merion Conservancy lead the group and taught everyone about the plants and animals that make the trail their home. See more in the photo gallery. 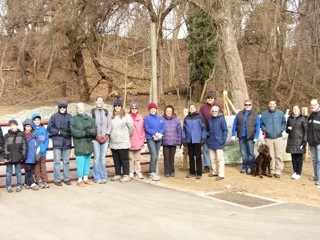 The Friends of the Cynwyd Heritage Trail (FOCHT) would like to thank everyone who came out for their Third Annual MLK Volunteer Day of Service for the Cynwyd Heritage Trail on Monday, January 16th, at the Barmouth Crossing (at the end of East Levering Mill Road after crossing Belmont Avenue) in Bala Cynwyd, Pa. It was a cold but fun day. Special thanks to Michelle Dunn from Keep Pennsylvania Beautiful who provided all the coffee, donuts, snacks, pizza and drinks for the day. To raise environmental awareness throughout Lower Merion Township and to highlight environmental achievements, the Environmental Advisory Council (EAC) is planning to sponsor the 5th Annual “Go for the Green” awards this spring. Learn more on the township’s web site here. Nominations are due by March 19, 2012. Please note, there is a limited amount of benches available. It will be first come, first serve. The minimium donation for a bench is $1500. 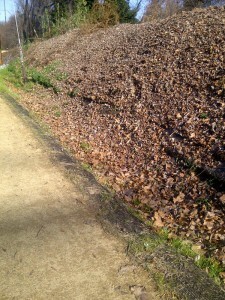 Attention Neighbors of the Trail: Please do not dump leaves on to the trail. 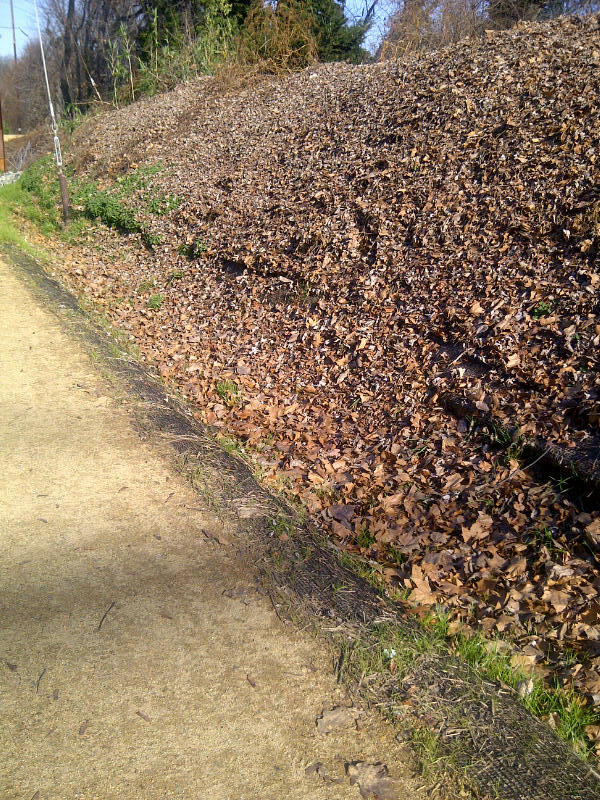 The leaves are blocking the drainage swales. On Saturday, December 3rd, Sav-a-Tree’s Alison Pottage conducted a workshop how to prune trees along the trail. The event was co-sponsored by Friends of the Cynwyd Heritage Trail, Lower Merion Township and Sav-a-Tree. It ran from 9:00 – 11:00 a.m. The Lower Merion Board of Commissioners authorized submission of a grant application to create a plan to connect the Cynwyd Heritage Trail to the Righter’s Ferry Trail, and also extend the Trail to Bala Station and City Avenue. As part of the second phase of a $10 million Regional Trails Program, the Delaware Valley Regional Planning Commission is accepting grant applications for trail-related planning studies, Chris Leswing, the township’s assistant director of planning, said in a memorandum which was included as part of the agenda for the board’s Building and Planning Committee meeting on Wednesday night. 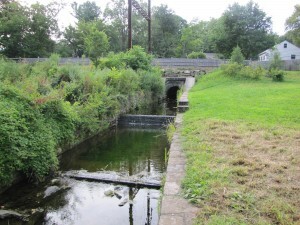 In the grant application, the township will seek $40,000 in funding in order to complete the Cynwyd Heritage Trail by connecting it to the Righter’s Ferry Trail—which is required to be constructed by Righter’s Ferry Associates along the Pencoyd waterfront—and to also extend the trail to Bala Station and City Avenue, Leswing said in the memo. The Township would provide a $10,000 grant match from unbudgeted funds in the Capital Improvement Plan. The 2009 Cynwyd Heritage Trail Master Plan recommended that a multi-use trail be constructed between the Cynwyd Trail and the Righter’s Ferry Trail through the 9-acre parcel donated to the township by Tom Connelly in 2006, but making the Connelly connection requires a high level of study because there is a significant grade change between the Righter’s Ferry Trail and Cynwyd Trail, Leswing said in the memo. The grant funds would allow the township to study the best way to solve the grade change with a multi-use trail, and explore extending the Cynwyd Trail a third of a mile from Cynwyd Station to Bala Station at City Avenue. The Cynwyd Heritage Trail was praised as the “crown jewel” of the Montgomery County Trail Network, in a recent report by the county Open Space Board to the County Commissioners. Speaking at the September 28 public meeting of the Commissioners, Open Space Board Chair Phoebe Driscoll credited Lower Merion Township and the Friends of Cynwyd Heritage Trail for making excellent use of the $1.5 million in county grants awarded to the Township for the project to date on an 80/20 county/township matching basis. The Trail was one of three county projects Driscoll highlighted as prime examples of 442 grants to townships and private organizations using funds authorized by county voters in 1993 and 2003. The other projects highlighted included an 87-acre working farm now serving an educational center and a 77-acre tract near Ambler rescued from residential development to preserve Wissahickon wetlands, woods, and a variety of recreational fields. 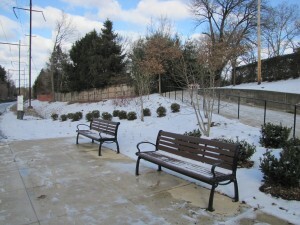 Three such grants to Lower Merion in recent years have made possible both the construction of the basic Trail, on the discontinued R-6 SEPTA rail line from Cynwyd Station to the Schuylkill River, and the crucial purchase of additional land from Westminster Cemetery and an abandoned spur line connected to the main Trail where it reaches the Manayunk Viaduct Bridge. The additional land purchases have significantly enhanced the Trail’s designation and appeal as a true “linear park” of 60 acres. 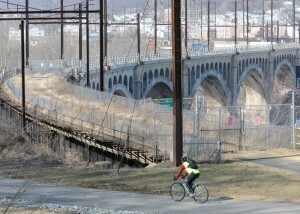 Thanks to a plan for conversion of the Manayunk Bridge, recently approved with funding from federal, state and local sources, Cynwyd trail users will be able by the end of 2013 to link up with a rapidly expanding network of regional trails. County open space funding has enabled Montgomery County’s network to expand from 12 to 53 miles since 1993. More than 10 miles of the regional network along the Schuylkill River are completed or in various stages of planning and construction within the city of Philadelphia. $55 million of the $150 million authorized by Montgomery County voters in 2003 remain to be appropriated before the current ten-year authorization expires in 2013. As part of the ongoing development of the Cynwyd Heritage Trail, nearly 40 volunteers worked on Saturday, November 12 to plant trees around the grounds of the former Barmouth Train Station near Levering Mill Road and Belmont Avenue in Bala Cynwyd. The Friends purchased 40 trees from the Pennsylvania Horicultural Society for the project. Trees purchased included Quonshan Cherry, Cherry Dogwood, and English Oak. Another workday occurred the following Saturday to finish mulching the area. Friends and Trail supporters are welcome to come out and support the Friends on workdays (which are listed on the Calendar, under the Events tab). Friends of the Cynwyd Heritage Trail led the workday with support from the Lower Merion Conservancy. 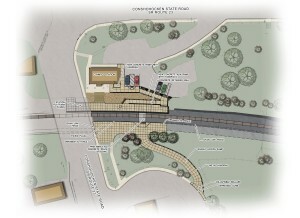 The design professionals and community members who collaborated in planning the Cynwyd Heritage Trail were concerned that the straight and moderately sloping alignment of the original rail bed along most of its length could lead to potential conflicts between high speed cyclists or skateboarders and lower speed runners, hikers, small children, and dog walkers. The solution was to provide two separate paths of different materials, to accommodate different levels of users. SOFT SURFACE (tan): It’s not just “dirt”! Actually, it’s a high-quality composite all-weather surface put in place to encourage its use as a “local” lane for slower users such as pedestrians, joggers, dog walkers, and small children on bikes or walking. ASPHALT (black): The asphalt surface provides an “express” lane for higher speed trail users such as adult cyclists, skateboarders, and runners accustomed to a harder surface. Please be aware that others may be using the trail differently than you. Have fun, respect other trail users and be safe. Dogs are welcome on the Trail but need to be on leashes. Even fairly placid breeds and individual dogs can be unpredictable out of their territory and when encountering unfamiliar people and other pets. For this reason, please keep your dog leashed on the Trail. It is the responsibility of the owner to have control of their pet at all times. In addition, owners are also responsibile for removing waste. Please pick up the waste and carry it out of the park. Take more than you’ll need on trails so you can help out someone who forgot. Tie extra baggies to your leash handle. Remind people that animal waste harms the environment. The Friends will be enforcing these rules on the Trail. 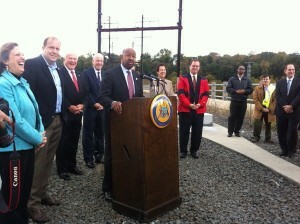 Mayor Nutter and other elected officials kicked off the next phase of development for the Manayunk Bridge. The bridge will use a bike and pedestrian trail to connect the Ivy Ridge Trail in Philadelphia with the Cynwyd Heritage Trail in Lower Merion. The event occurred on October 20, 2011. Attendees were: Mayor Michael A. Nutter, Montgomery County Commissioners Chairman Jim Matthews, Montgomery County Commissioner Joe Hoeffel, Lower Merion Commissioners President Elizabeth S. Rogan, Lower Merion Commissioner Brian Gordon, State Senator Daylin Leach, Lou Cappelli, Chairman of DVRPC, Deputy Mayor for Transportation and Utilities Rina Cutler, Joseph M. Casey, General Manager, SEPTA. On September 15th, 50 residents of both city and suburb converged in Ardmore to discuss design plans for a multi-purpose trail across the Manayunk Bridge. The project is a collaborative effort between several agencies, and brings together the City of Philadelphia, the Schuylkill Project and the Township of Lower Merion, in addition to SEPTA, the owner of the bridge. 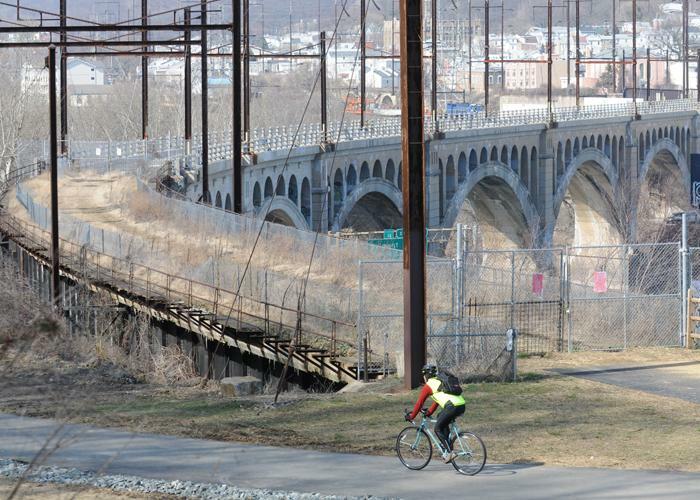 The Manayunk Bridge ends at Dupont & High Streets – the site of a former train station – and would be used to connect the Ivy Ridge Trail to the Cynwyd Heritage Trail in Montgomery County. The meeting lasted approximately two hours and was facilitated by the bridge’s project manager, Jeffrey Riegner. Biggest concerns were design, timing, and safety. Montgomery County Open Space Board Gets Tour of the Trail. On August 22, the Montgomery County Open Space Board had a tour of the Cynwyd Train Station, the Cynwyd Heritage Trail, and the Manayunk Bridge. The Montgomery County Open Space Board is comprised of five members appointed by the Montgomery County Commissioners. The board meets monthly to review open space grant applications and make recommendations to the County Commissioners for open space acquisition and preservation. Attendees included Phoebe Driscoll, Paul Meyer, Bob Thomas, Mark Vasoli, Bruce Reed, Steve Nelson, Ken Hughes, John Corcoran and Beth Pilling. Tour were led by Chris Leswing (Lower Merion Township), Kim Douglas (Studio Gaea), Byron Comati (SEPTA), Robert Strauber (Cynwyd Club), Peter Brigham (neighbor), and Jerry Francis (Historical Society). Friends of the Cynwyd Heritage Trail have been awarded a Specialized grant to purchase specialized bicycles to haul supplies and tools for the Trail. In addition, this grant also supplies the Trail with bicycle art bike racks. The Friends are very excited about this grant and would like to thank Specialized for their support. Special kudos also go to Boris Kaplan and Dave Rende. To find out how Specialized can help your organization, check out their site. – Dogs are allowed on short leashes. On Thursday, June 9, 2011, the public was invited to North Light Community Center on Green Lane, Manayunk to share and provide feedback about the Manayunk Bridge trail. Kay Sykora, director of the Schuylkill River Project kicked off the meeting and the design team, led by Whitman, Requardt and Associates gave a background of what has been happening. Attendees included Friends of the Cynwyd Heritage Trail, Lower Merion Township, Greater Philadelphia Bike Coalition, Schuylkill River Project, Lower Merion Historical Society, SEPTA as well as many neighbors and trail and biking enthusiasts. For even more information about the meeting, check out the blog. 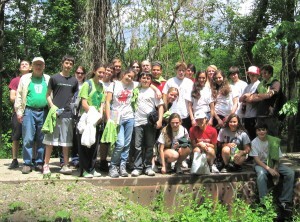 May 10, 2011 – Harriton High School students were part of a service day effort to clean up the Trail. It was a beautiful day and students worked hard and received FOCHT t-shirts for their service. Students perform various activities and tasks on the trail. Nearly thirty students participated. 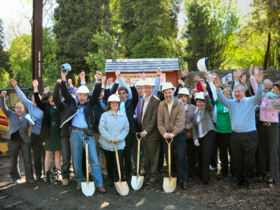 On Thursday, May 5th, Lower Merion officials symbolically broke ground for construction of the Cynwyd Heritage Trail. However, this is not the first time the trail has seen a shovel. 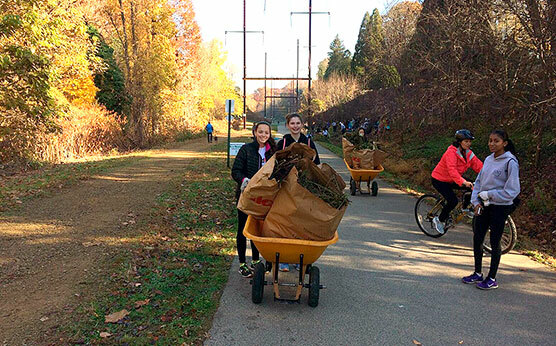 Over 30,000 volunteer hours have been spent transforming an abandoned, overgrown rail bed into the basis for a new multipurpose trail running from historic Cynwyd Station to the Schuylkill and one day across the river to Manayunk. Construction started in March on Phase 1 of the two-mile double trail, putting it on track toward a September opening. The Cynwyd Heritage Trail design has been selected to receive a Merit Award from the Pennsylvania and Delaware Chapter of the American Society of Landscape Architects (ASLA). It will now be entered in the ASLA national competition, which recognizes the best in landscape architecture from around the globe. The award was presented to the Township’s Chris Leswing at the ASLA regional conference in April 2011. Founded in 1899, ASLA is the national professional association for landscape architects, representing more than 17,000 members in 48 professional chapters and 68 student chapters. Landscape architecture is a comprehensive discipline of land analysis, planning, design, management, preservation, and rehabilitation. ASLA promotes the landscape architecture profession and advances the practice through advocacy, education, communication, and fellowship. Members of the Society use their “ASLA” suffix after their names to denote membership and their commitment to the highest ethical standards of the profession. More information is available by visiting www.asla.org. Graffiti is “unauthorized writing or drawing on a surface in a public place.” Graffiti is “unauthorized”, and it destroys property. Repairs are costly for the property owner. Please help us end graffiti. If you see graffiti on the Trail, please report it immediately to Dave DeAngelis (Parks and Recreation) at at (610) 667-1590 or send Dave an email at ddeangelis@lowermerion.org. Plant One Million is a regional partnership led by the Pennsylvania Horticultural Society (PHS) to plant one million trees throughout 13 counties in southeastern Pennsylvania, New Jersey, and Delaware. The goal is to restore the “tree canopy cover”—the area of land shaded by trees—in the Greater Philadelphia Region to 30 percent. The tree canopy is the upper branches or crowns of mature trees. Measuring the area of land covered by tree canopy is an important yardstick for a healthy environment, since trees improve air and water quality and help reduce erosion, water pollution, and flooding. Learn more about the benefits of trees. In recent decades the Greater Philadelphia Region has lost millions of trees to development. To address the problem, the Pennsylvania Department of Conservation and Natural Resources created TreeVitalize, a public/private partnership led by PHS in southeastern Pennsylvania, which has added 150,000 trees since 2004. Plant One Million expands and builds on that program. To learn more about this initiative, please visit the PHS site.